Marchington Stone recognises the need to positively manage the impact of our activities on the environment. We are committed to continual improvement in our environmental performance and we set defined environmental objectives and targets, based on our significant environmental aspects. 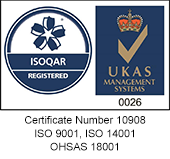 We take our responsibilities seriously and are certified by Alcumus ISOQAR to ISO 9001 for Quality Management System, ISO 14001 Environmental Management and OHSAS 18001, Occupational Health & Safety. Please see our Resource Centre to review our policies on Environment, Health & Safety, Bribery & Corruption and Modern Slavery.